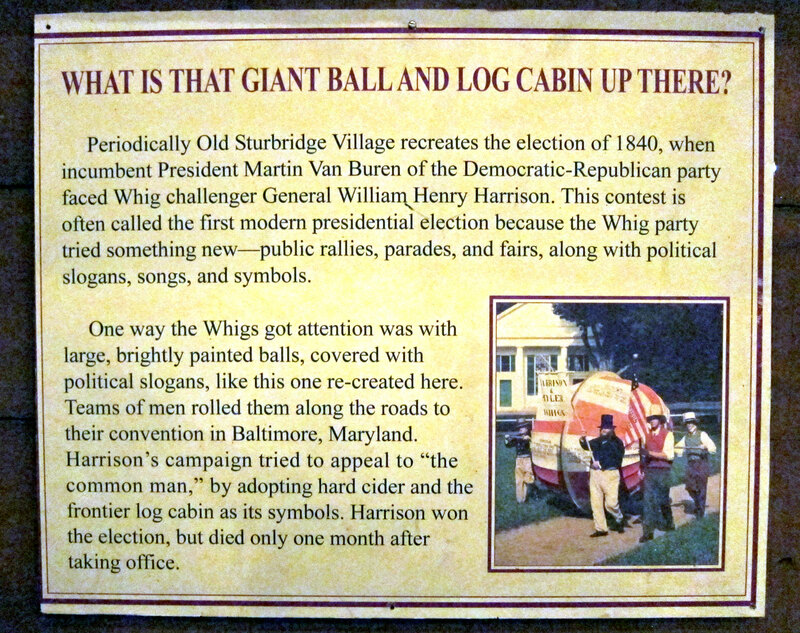 In October I visited Old Sturbridge Village (OSV) for the first time in nine years, and it had been decades before for my previous visits. I spent the whole day there – loved it – and purchased my membership when leaving. So many events I would like to attend there in 1838, and only about two hours away. 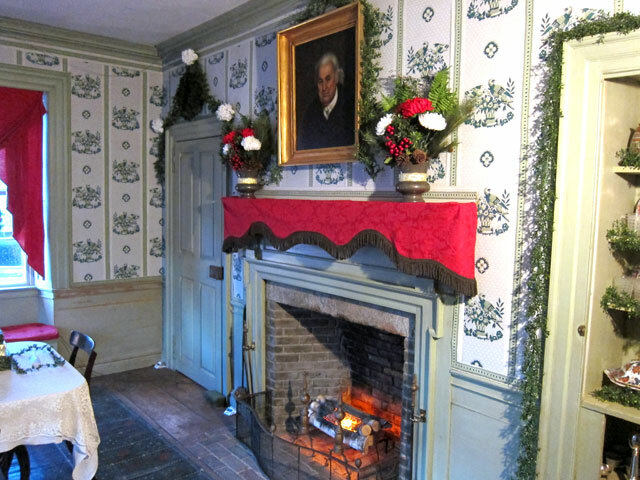 And, I journeyed there again 21 December for their holiday event — Christmas by Candlelight. 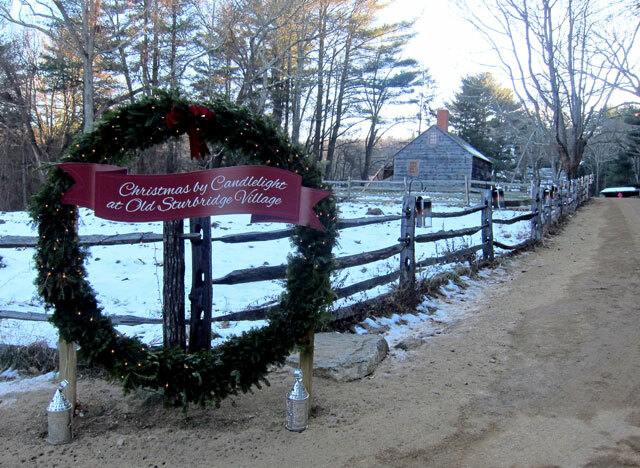 A perfect fundraiser for OSV, and the perfect setting to experience Christmas history and traditions. 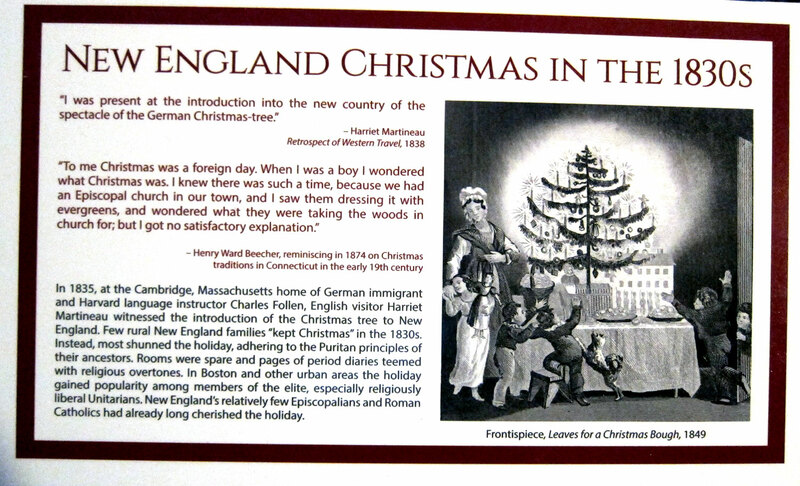 But, you must know that in 1838 (the setting for the village’s learning experiences) Christmas was not yet celebrated in New England homes, nor in America. I arrived when the village opened at 3PM, and took it all in until closing at 8PM. 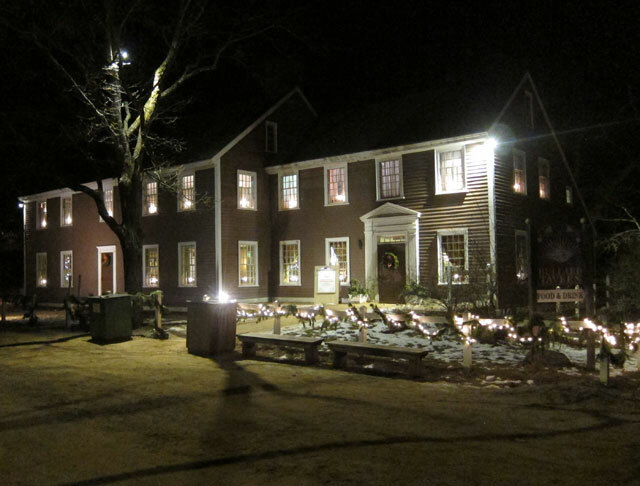 I then waited for dinner at the Bullard Tavern at 8:30. Only thing lacking was a total white covering of snow with bright sunshine. 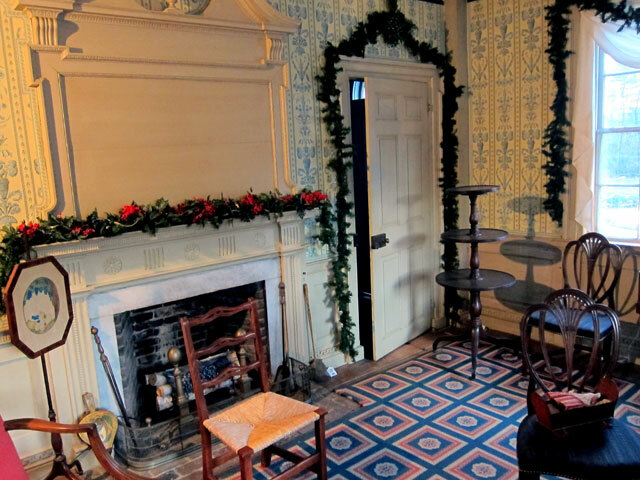 I climbed on George’s horse drawn wagon for a tour around the Common (the farm and mill area is closed for the season), and then began my walking tour stopping first in the one room law office which was decorated to be Scrooge’s Counting House. how much fun ! 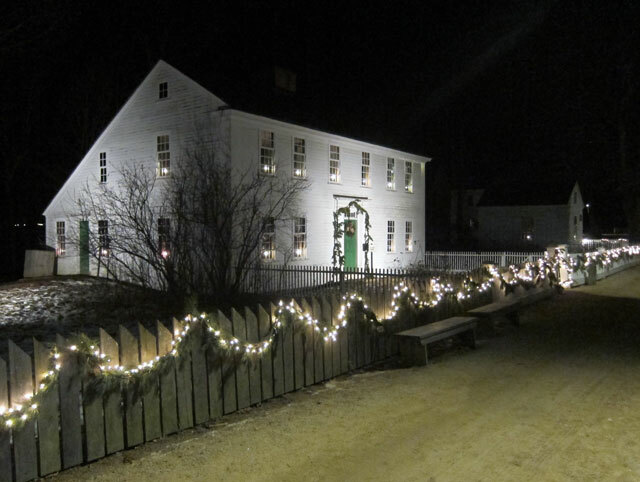 You know I staged my adaptation of A CHRISTMAS CAROL for seven years raising over $25,000 for local food shelves, so what a treat to find the Parson’s House and Barn were staged reflecting on Dickens’ classic tale. 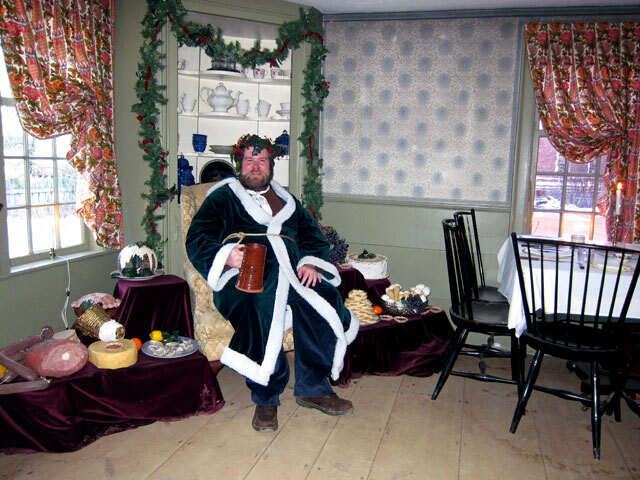 as you entered the home, The Ghost of Christmas Present greeted you, decked out in his finery and mounds of food – faithfully replicating the original illustration in the first edition of A CHRISTMAS CAROL. 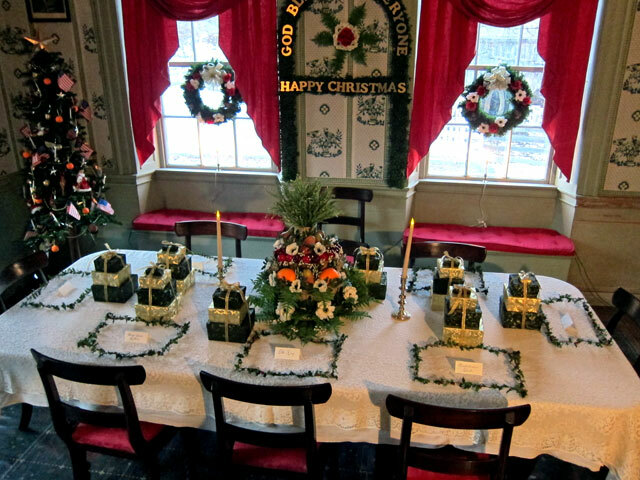 in the keeping room to the rear the Cratchit family was preparing their Christmas Dinner. 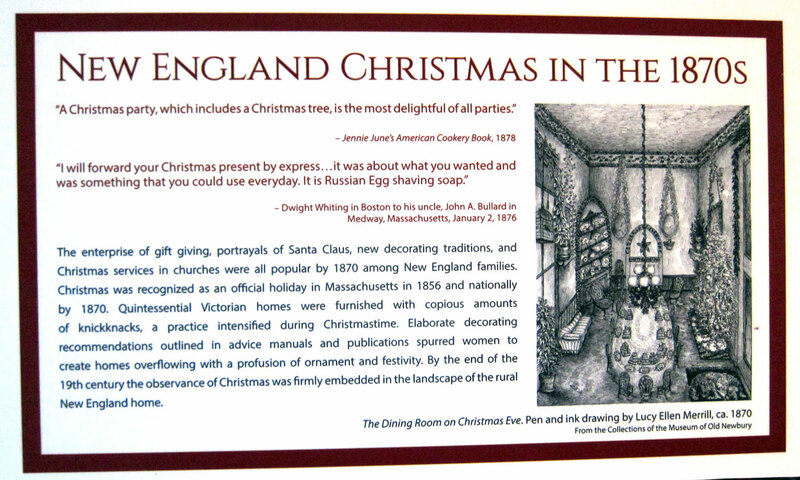 In many of the homes flyers were available with period recipes for food and drink. 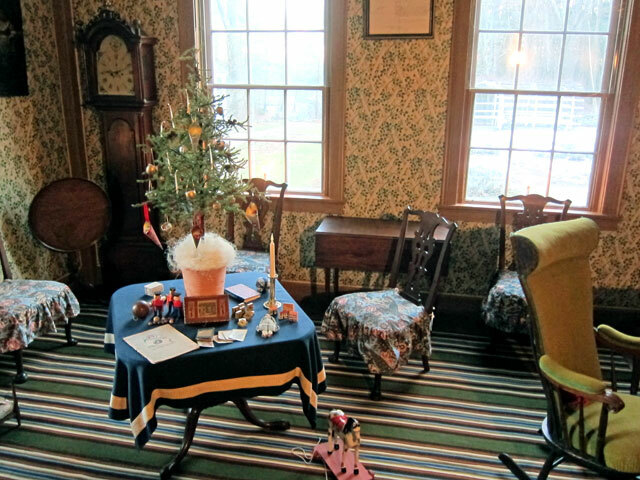 Look at the fire, and you will see their Christmas Goose hanging on a string which would be twirled. As it unwound it maintained even cooking with the drippings coating throughout. And, don’t fear, to keep all the cooking and dripping even, the goose is next rehung the other way. Well, one interpreter said this is the origin of “get on the ball” – someone forgetting the words would be told to look at and “get on the ball.” So, I had to research, and there are stories about “keep you eye on the ball” and “get on the ball,” but at long last I found additional supporting information, which you may enjoy reading (click the link) – which in part says about the 1840 campaign – “AS IF THE CAMPAIGN needed another novelty, Whig supporters started rolling huge paper or tin balls printed with campaign slogans from town to town as part of parades and rallies. 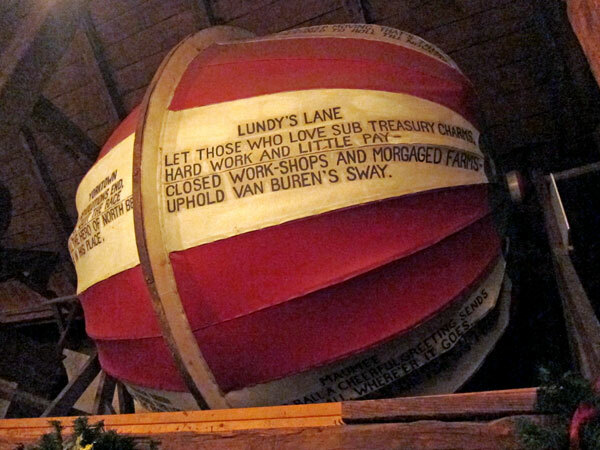 The idea owed its inspiration to remarks made by Democratic Senator Thomas Hart Benton … Benton said, ‘I set this ball in motion.’ … ‘Keep the ball rolling’ survived the campaign to become a common American expression.” Your history lesson, and “fast fact” from this post. 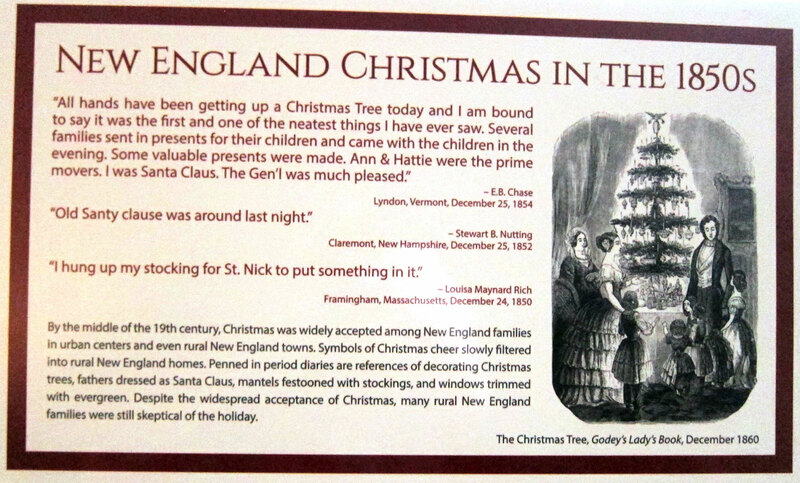 The 1796 Salem Towne House at the opposite end of the Common from the Center Meetinghouse presented a series of Christmas vignettes in three rooms (click the word images for larger reading size). I continued touring around taking in the Printing Shop (oh, I wish I lived close by and could become an interpreter in the village), other exhibits and the Magic Show. 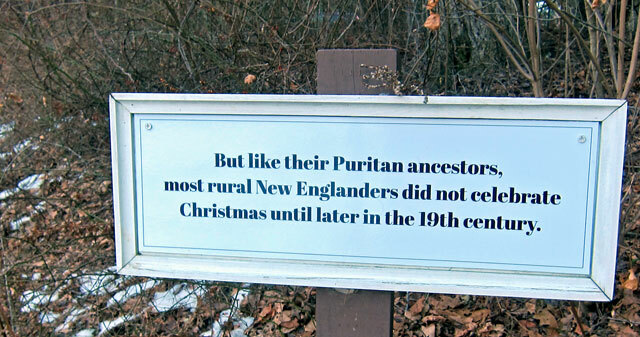 Alright, more fascinating history, sorry. The magician patterned his act after acts done by Richard Potter – the first American born magician making fame – read his story. 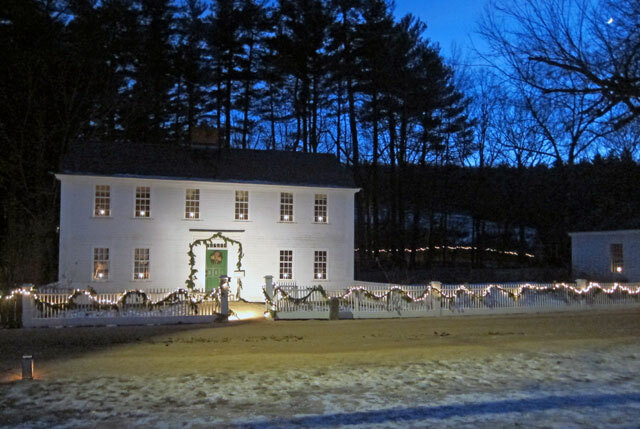 And, also fascinating, Potter (1783-1835) purchased 175 acres in Andover, New Hampshire, building his estate in 1814. 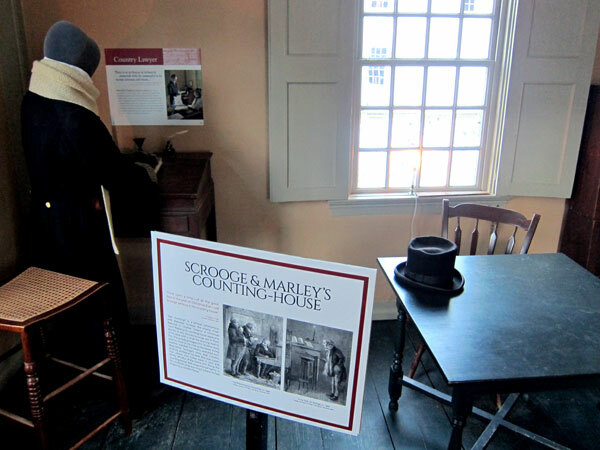 The area is still called “Potter Place” – I have stopped to read more about Richard Potter, and I cannot wait to visit Potter Place with BB1 or BB2 and all the points to see. Concert in the Center Meetinghouse. Santa and a young fan. 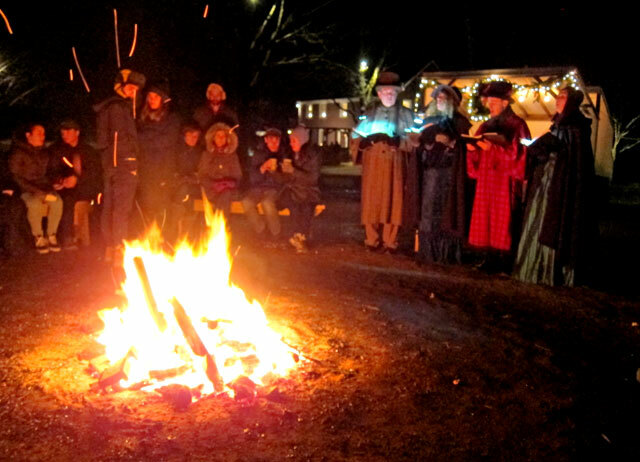 Occasionally I would sit at the fire, hear the carolers, and listen to conversations (surprisingly this was the first visit to OSV for many people). 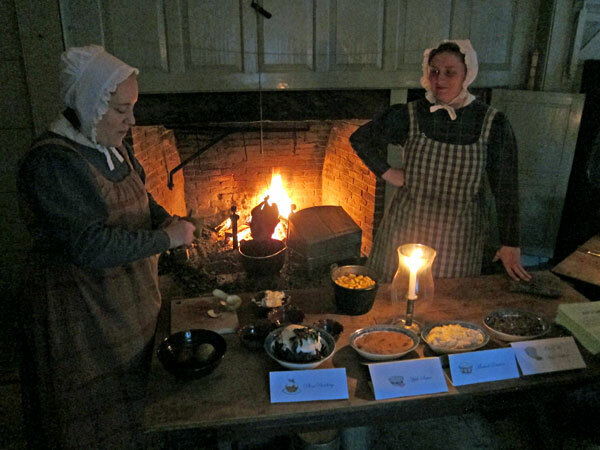 and, soon it was over and time for dinner at the Bullard Tavern which is a recreated building constructed as the village opened in 1946. 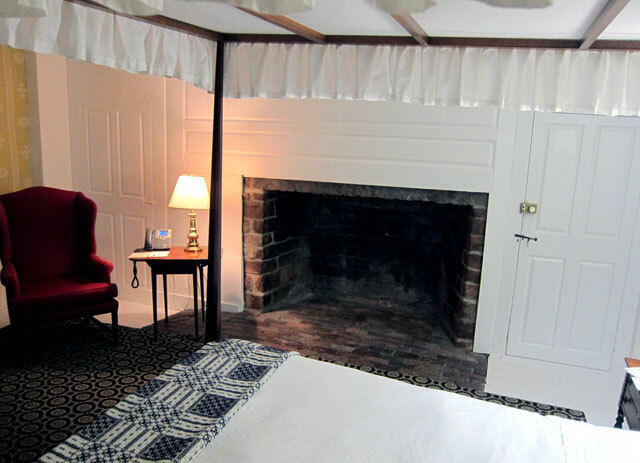 There are many common rooms outside the dining area which has a massive fireplace and architectural features salvages from covered bridges. I was seated in front of the fire, and amassed my plate from the bountiful buffet. and then it was over, and I headed back to the parking lot. and back to my room at the Oliver Wight House. This time I was on the first floor in a room that originally would have been the keeping room with this massive fireplace. Heading south to Sturbridge I travelled back roads through Worcester County which is in the middle of the state and extends from the NH to CT borders. When I stopped for lunch at Heavy Evie’s Diner in Rutland, (Massachusetts not VT) I was studying my map (yes on real paper) because I had made a wrong turn somewhere earlier. My server came up shocked, “you are actually looking at a real map,” she exclaimed. I opted for the homemade meatloaf, a massive platter for $8.99 – Heavy Evie’s is worth visiting again. So, on Friday when heading home, even with the impending storm, I wanted to re explore the route home and see where I went wrong (and avoid traffic on the “fast” roads). I have traveled through this area several times in the past 3-4 months, and look forward to further explorations next year in one (and both) of my BBs. Well, I found the turn I missed off US 202 on the way down. 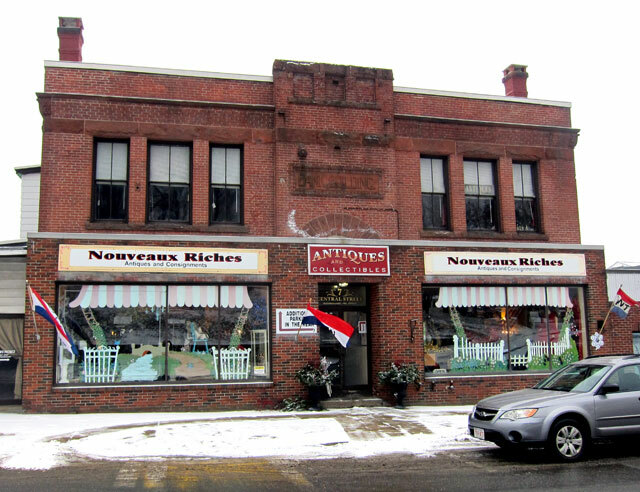 I was on the right road on the way back, and at the intersection there was one of the greatest antique shops I have been in for some time – Nouveaux Riches in Baldwinville, MA – so well decorated with eye candy and treasures everywhere. Owner Elaine was a delight and extremely talented with her choices and displays. 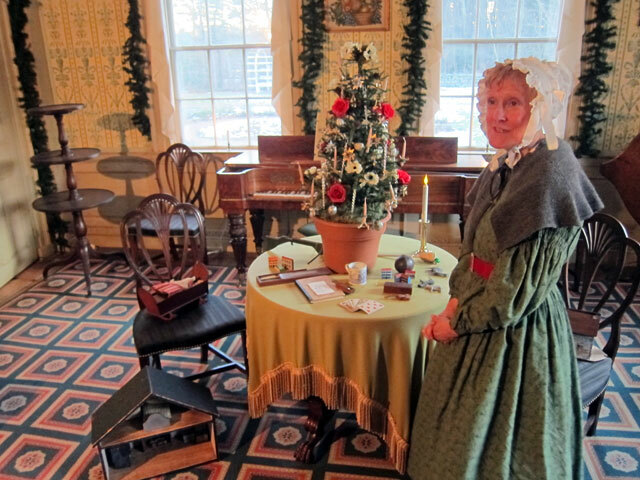 Her displays of items for sale change with the season, and her Christmas things were amazing. Her shop in an old Wells Fargo Building alone must be seen. 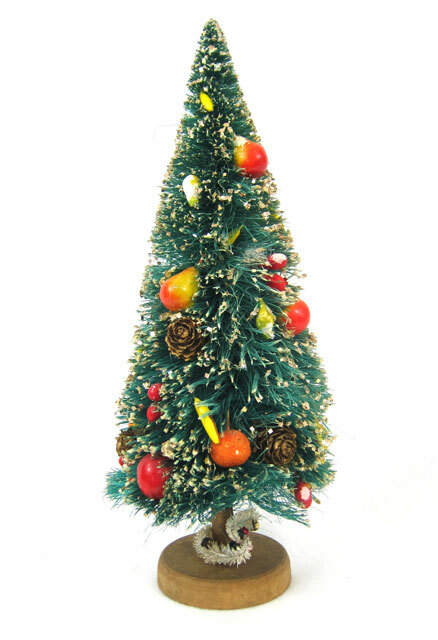 You know I collect old “bottle brush” trees, and one of her trees “spoke to me.” I had never seen one decorated with old ceramic fruit before. It was special, high on a shelf, with a matching price. But if you have never seen it, it fits in your collection, you “buy it when you see it,” regardless of price so you will not be disappointed later. She had a holiday sale of 20% off, but cut further and said, $35 — no hesitation, my “new” circa 1940s 12 inch tree is in its new home. Your collections should evoke memories. 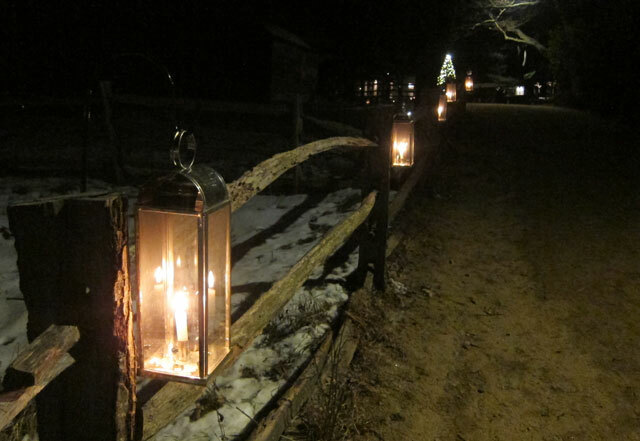 Below, the tree with the fence around it I found this year for $20 at Colony Antiques. Santa had been in a box forever, probably from a yard sale in New Jersey. The two cars on the left, ironically, I purchased for $5 each in 1964 in an antique shop on US 20 in Sturbridge or Charlton, MA, while painting a barn. That cast iron fire engine – $4.50 in Gayloardsville, CT in 1962 – and I shared that story with you in October 2014 – and of course the Dinky Toys are an MG and TR3 – not mine as a child, but when I was buying books and antiques in a house in Westmoreland. Oh, memories surround me. 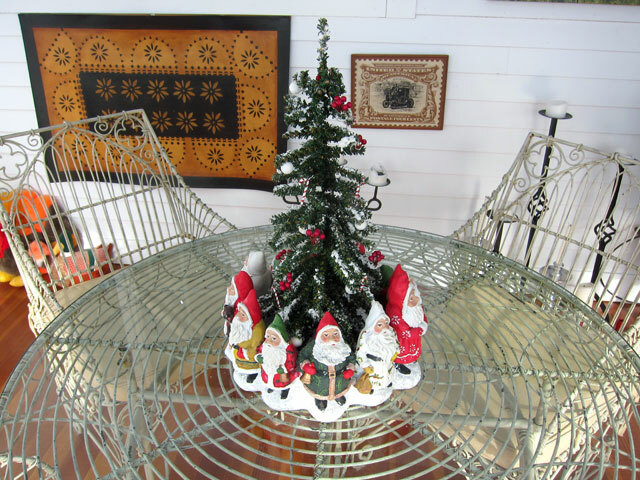 and here is one of my larger trees in a ring of Santas Mari gave me, and now proudly adorning the porch. 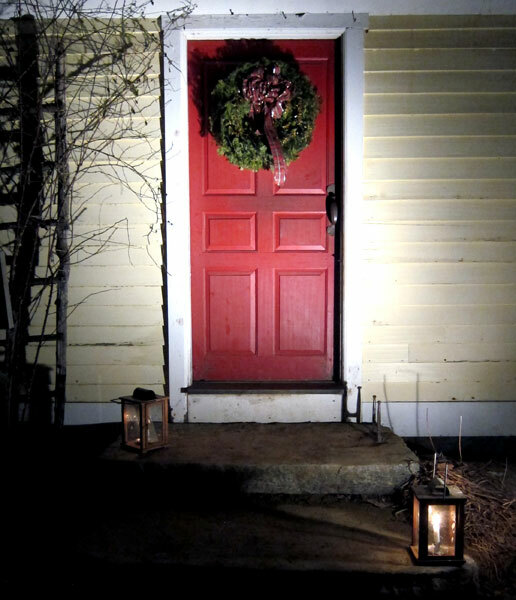 This entry was posted in Day (or maybe two) Trips, Miscellaneous Musings and tagged Christmas by Candlelight, Massachusetts, Old Sturbridge Village. Bookmark the permalink. I, too, love bottle brush trees. Your new one is really fine! Is there any way to tell new ones from vintage ones? As always informative, great pics and fascinating details. Happy holidays. Merry Christmas!!! That was quite a treat to read on Christmas Eve! !